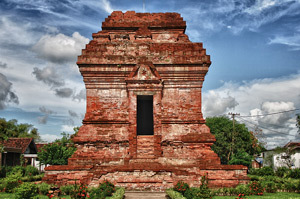 Since 1851, Sidoarjo was known as Sidokare. It was one of Surabaya’s area and led by a regent named R. NG. Djoyohardjo. In 1859, Sidokare had separated with Surabaya and become its own regency. Then in couple month, Sidokare had change become Sidoarjo. Sidoarjo recognized for multifariously its sea fish like milkfish, prawn, crab, cockle mussel, etc. Sidoarjo produces many kinds of foods with fish as the main production. The typical of fish cuisine are easy to find in Sidoarjo, for example; milkfish smoke, a nice food at Mojopahit Street, Sidoarjo. Beside that the tourists also can enjoy another cuisine like, milkfish presto, otak-otak milkfish, lontong mussel, condiment of the fermented prawn, prawn crisply, mussel crisply, etc. Some village in Sidoarjo also produce ‘Batik’ painter, such as; Jetis village, Sekardangan village, and Kenongo village. The pattern and motif Batik of cloth Sidoarjo are captivating on the market. Usually, it sell with systems at retail or grocery, so that the tourist is easily get the quality goods.